More and more nowadays we are seeing a massive influx of widescreen format monitors into the market. Manufacturers seem to have forgotten about the traditional 4:3 and 5:4 format screens and are instead releasing 16:10 format models in increasingly larger sizes. This has coincided with the rapid emergence of 20”, and more recently 22" models, into the market as more and more users want larger screens and now, a wider field of view. There are plenty of models now available in the market in WS format, and with the variety of panel technologies used, variety of functionality and designs of the models and variety of specs; it is certainly an interesting time for the TFT users. However, moving to WS can be a confusing situation and there are certainly a few things to consider when choosing a WS monitor to suit your needs. One thing to note is that some screens use the same native resolution, despite the screens being of different sizes. 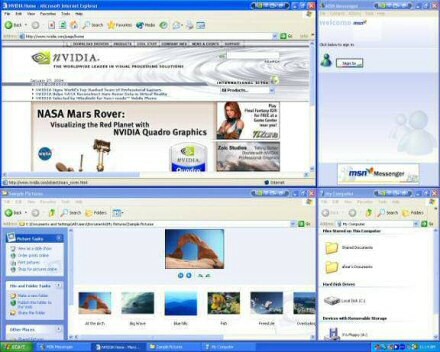 For instance the 23”, 24” and 27" screens all use 1920 x 1200 resolutions. However, the pixel pitch is smaller on the 23” and 24" models as a result and so the image is slightly smaller and more tightly packed. This could be looked at in two ways, both providing a small text size for possibly sharper image quality, or perhaps this is considered too small for comfortable use. Movies are clearly an area which makes the most of the WS format. Films, and now increasingly TV shows, are recorded in WS format and playing them on a 4:3 / 5:4 aspect screen results in black borders at the top and bottom as the video is still in the 16:10 or 16:9 format. With a WS monitor, the actual video content can fill more of the screen and black borders are significantly reduced. They are often still there, but WS obviously lends itself more to this use than 4:3 format screens. If you want to reduce the borders more, or even remove them, you can use software media players to ‘zoom’ in on the video. This has the effect of stretching the image to fill the screen, but does result in some of the image being cut off, or stretched, depending on how you zoom in. Media players like Media Player Classic have this feature and are worth testing out if you want to remove black borders even more. WS format screens really do lend themselves to movie / video application. One area which perhaps isn’t as intuitive for WS format is gaming. More and more modern games now support WS resolutions by default, and so having a WS format screen is not a problem. In fact games can really lend themselves to WS format as you have more peripheral view for first person shooters, and a wider field of view for sporting, racing and even strategy games. If you are intending to use a new monitor for gaming it is worth understanding whether the games you intend to play will support the resolution or format. You can play games outside the screens native resolution and nowadays the image interpolation for this purpose is fairly good as standard, but obviously varies somewhat from model to model. If you want to avoid the image being stretched you would need to ensure you play at a resolution of the same aspect ratio as the screen. If you try and run a game at a 5:4 resolution like 1280 x 1024, the screen will still be filled, and while the image is interpolated to the screen resolution, it will become distorted outside its proper aspect ratio. One way to overcome this is with 1:1 pixel mapping (see below). If your favourite games don’t support WS format by default, it is often possible to “hack” them to allow support of WS monitors. An excellent resource for this is Widescreengamingforum’s master games list. They have a full list of games with hacks available to support WS. Their forums also contain a lot of discussion about WS gaming and monitors. This is an important feature on WS monitors and invaluable if you are looking to play 4:3 or 5:4 format games on the screen. This option allows the monitor to support a series of modes, which avoid you having to force the game to fill the whole screen. This can avoid stretching of the image out of its aspect ratio, and also provide the option to play at the games true running resolution, regardless of what the screens resolution is. Fill / Full - Fill the screen regardless of what resolution the game is running at. This will stretch the image to the full resolution of the screen and ignores the aspect ratio as well. This can lead to stretching of the image and makes a 4:3 format image disproportionate. This is essentially what a monitor without 1:1 pixel mapping would do all the time. Aspect – This retains the aspect ratio of the source, but fills as much of the screen as possible. This would ensure that any 4:3 aspect games retain that format to avoid stretching, but would make the most of the size of the screen as well. The image would be interpolated beyond its operating resolution if need be. There would be black borders down each of the sides. 1:1 – This option would retain the exact resolution of the source and the rest of the screen would be blacked out with borders. This would mean you are effectively using a smaller screen within the larger screen but without any interpolation of the resolution, and the aspect ratio being maintained. This option would result in borders perhaps on all sides, depending on the resolution selected. This feature is common on Dell screens as well as some other new models. However, it is far from being standard. See the monitors table section to identify which models support this feature. For those which do not support this feature through the monitor hardware, it may be possible to function through software. NVIDIA driver software for example has this option and some screens allow you to run 'aspect' and '1:1 centred' options even where the screen itself will not support the feature. Some models will not allow you to do this however, but see the monitor table below for details on which do support this. With the arrival High Definition content, the IT industry has developed a new norm referred to as HDCP (High Bandwidth Digital Content Protection). This is a means of potentially overcoming piracy and is a protection algorithm used for future HD content including Blu-Ray and HD-DVD. For this to operate, the source (e.g. DVD), graphics card and monitor would all need to have HDCP compatibility in order for the source to be viewable. Monitors which are HDCP certified also include a digital interface as this is inferred by the technology. HDMI and / or DVI connections must be present for true HDCP certification. If this HDCP certification is not present in all elements, the image is likely to not be displayed at all, and you will see only a blank screen or perhaps some very intrusive “warning” messages. This feature is becoming a little more common now, but there are still only a handful of monitors with this support. Since HDCP is very much related to multimedia content, monitors in WS format are a clear first target for manufacturers looking to add support for this protection. There have been a few models like the Dell 2007WFP and Dell 2407WFP which now feature HDCP support over DVI connection. See the monitors list for details of which models support HDCP.